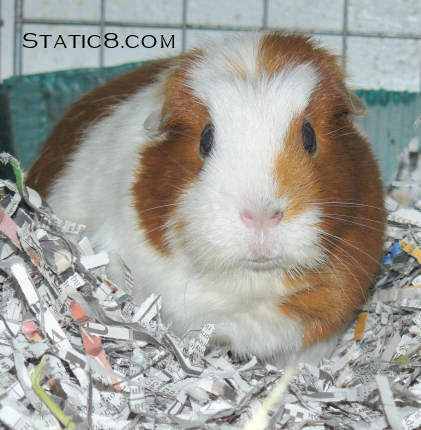 This is my friend, Boo the guinea pig in her house. It's been just over six months since her friend, Twitch, died. Boo was very depressed for about a month, but we're okay now. We've fallen into a good, happy routine. Boo gets a special breakfast every morning. Tangerines, carrot slices and maybe one other random treat from the fridge. And of course, I make sure she's good on timothy hay and kibble. I spend time with her every morning, no matter what! SO looks in on her during the day, maybe bringing her a treat. When I get home from work, yep, more treats! Usually celery, fed by SO with me smiling on. Then, in the evening, I let Boo out and she runs around on the floor. Sometimes she gets a really good workout... running laps. Other times, she wants to go right back into her house. I try to encourage her to have a little bit of fun, but sometimes there is no talking to her.